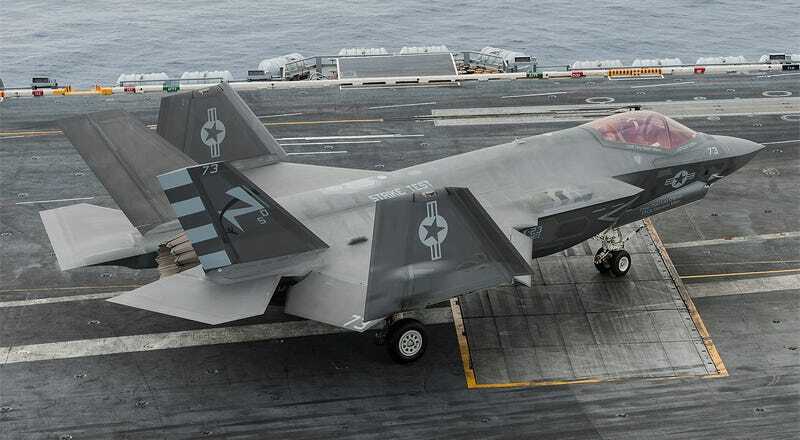 A report from Center for Strategic and International Studies called “Project Atom” urges the Department of Defense to make the Navy’s F-35Cs “dual role capable.” In other words, they want to make sure the jet can drop conventional munitions and nuclear ones, all in an effort to surround potential enemies with a more “neighborly” nuclear deterrent. According to our friends over at Flightglobal, the Pentagon has only committed to making the USAF’s F-35As nuclear capable. The CSIS’s report claims that adding a carrier-based nuclear deterrent would be a “visible manifestation” of the U.S. honoring its commitment to defend its allies around the globe. Such a strategy emanates from the idea that a deterrent is more effective when it’s forward deployed to positions in and around an ally’s geographical area. Basically, a much closer proximity manifestation of the U.S. nuclear umbrella. The U.S. has relied more and more on long-range nuclear deterrents, include land-based ICBMs, submarine launched SLBMs and heavy bomber delivered nuclear bombs and cruise missiles, with only a small fraction of the American nuclear arsenal being tactical in nature and deliverable via fighter aircraft. The nuclear weapon of choice for the F-35 will be the upgraded “smart” B61-12 thermonuclear guided bomb, a program that has had to struggle for funding, but is seen as essential for maintaining an air-dropped tactical nuclear capability. Currently, only the USAF’s F-35A is due to become nuclear capable, with the fully developed B61-12 around 2024 if everything goes as planned. We had 7,000 nuclear weapons forward-deployed in Europe at the pinnacle of the Cold War... In Asia, we had almost 1,000 deployed on the Korean Peninsula. About 3,000 total were in the Asia Pacific theatre. When the Soviets looked out at their borders, they didn’t just see a ring of American men and women in uniform, they saw a ring of nuclear weapons. They knew that any major, conventional aggression on their part would go nuclear because all the weapons were there. The report also adds that scaled response options need to be made available by fielding smaller yield, highly targeted nuclear weapons. Currently, the U.S. nuclear force is organized around a massive nuclear response, which limits flexibility to certain lower-level scenarios where tactical nuclear weapons or even exotic versions of tactical nukes built for hitting deep buried bunkers or to cause maximum electromagnetic pule destruction could be used instead of high-yield strategic nuclear weapons as a way to limit escalation. The CSIS report and Mr. Murdock’s suggestions are an eye-opening reminder of the times we are now living in. Although they seem quite extreme, and even mimic America’s nuclear posture during the the Cold War, they do have some merit. The sad truth is that there seems to be a heavy amount of denial out there as to just how precarious things have become geopolitically around the globe in over the last 15 months. Nobody wants to admit that a new Cold War has sprung, especially considering all the other problems that need fixing, including a rising and more stubborn China and their extra-territorial ambitions and the spread of Islamic Extremism that features a whole new level of brutality in the Middle East. This is not to mention a cascade of failed states that have occurred since the once naively hopeful Arab Spring began. A potential nuclear arms race around the Persian Gulf, increasing tensions between India and Pakistan, a psychopathic kid running a nuclear armed North Korea, massive cyber vulnerabilities and global warming can all be added to that list. All this has been factored into the Bulletin Of American Scientists historic Doomsday Clock recently, which has been pushed forward from its 2012 index of five minutes to midnight, to three minutes to midnight as of last January. This is the closest it has been to the Armageddon mark since 1984. The only other time it has been three minutes to midnight or less was in 1953. Unchecked climate change, global nuclear weapons modernizations, and outsized nuclear weapons arsenals pose extraordinary and undeniable threats to the continued existence of humanity, and world leaders have failed to act with the speed or on the scale required to protect citizens from potential catastrophe. These failures of political leadership endanger every person on Earth. Despite some modestly positive developments in the climate change arena, current efforts are entirely insufficient to prevent a catastrophic warming of Earth. Meanwhile, the United States and Russia have embarked on massive programs to modernize their nuclear triads—thereby undermining existing nuclear weapons treaties. The clock ticks now at just three minutes to midnight because international leaders are failing to perform their most important duty—ensuring and preserving the health and vitality of human civilization. Will we see the widespread deployment of tactical nuclear weapons as an attempt to limit the possibility of a mutually assured destruction (MAD) strategic nuclear weapons exchange in the coming years? It is quite possible. The new military reality for the U.S. will be one of wars not of choice but of necessity, ones we do not start, but are obligated to end. Should such conflicts occur, they will not be limited to small-time rogue regimes and third world failed states, but could very well include nuclear capable near peer-state actors. These wars will most likely be characterized by limited but rapid and violent exchanges as the result of territorial disputes. Although these exchanges will begin conventional in nature, escalation is a squirmy thing to predict, and there is no telling if, or when, a nuclear option could be introduced by either party. As such, introducing throngs of tactical nukes into such a mix may also be a form of introducing what could end up being a rapidly escalating nuclear exchange just as much as they could represent an option for a limited nuclear response. This perilous nuclear tightrope was walked throughout the Cold War, at least before MAD became the unofficially agreed upon policy of the USSR and USA, and it is very sad, if not terrifying, seeing that metaphorical tightrope being strung up once again.